Hi! I am using Unity with Vuforia extension. And I want to animate an object, which comes from behind the ImageTarget and goes in front of it. I want to make it coming out of the picture. Is there a way to make the image transparent for the camera, but I don't want the objects to be drawn behind it? This is an AR app. When I point my camera to the real painting the frameworks recognizes the image below (as a marker) and then draws the red cube. This is what I see in the editor, but when I build the app, I don't render the image, because I don't want to project the image of the painting on the camera image. 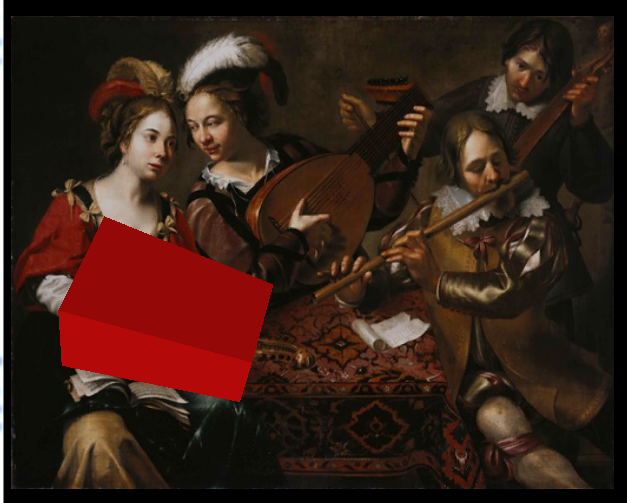 But as I don't render image, the whole cube can be seen, and it not "goes through the painting". I hope it is clear now, what I am trying to do. Create a plane that sits in the same position as your image marker (or just behind it). Then use a material with the 'depth-mask' shader to render that plane. Any object behind that masking shader is invisible (i.e. all you'll see is what the device camera is seeing). alpha is a number between 0 and 1, 0 = fully transparent, .5 something like fogged glass, 1 = non transparent. I updated my question, maybe it is clear now what I am trying to accomplish. Depth-mask works great, but the plane has to be attached to the image marker of the object to be concealed.